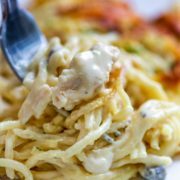 This Chicken Tetrazzini Casserole is a creamy, chicken pasta dish that’s perfect for a mid-week comfort food dinner with lots of cheese and chunks of rotisserie chicken baked to a golden brown. 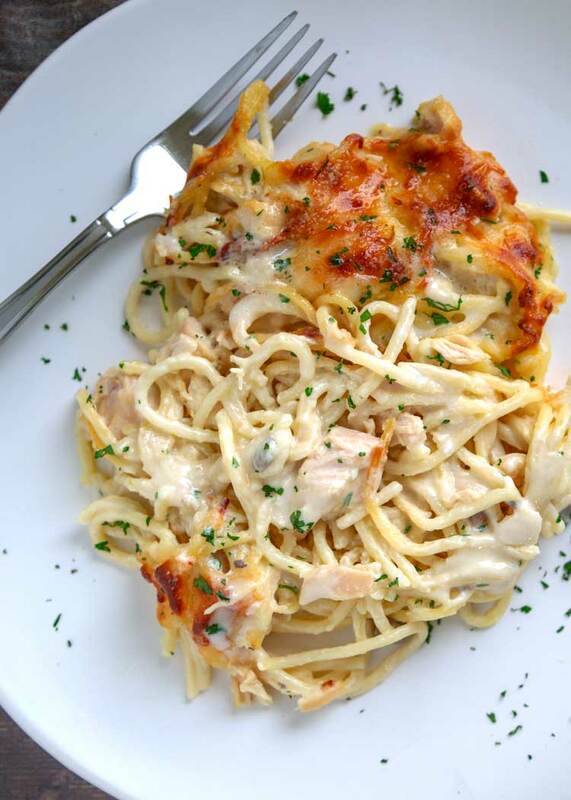 Pasta, chicken, cheese… who can resist? Not me. Apparently it’s named after Italian opera star Luisa Tetrazzini in the 1920’s by a chef at the Palace Hotel in San Francisco, but who really knows its origin. All I know is this is pure comfort food. 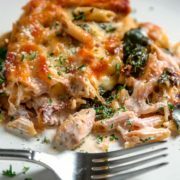 Using rotisserie chicken to make it easier, this pasta dish uses cooked spaghetti and the sauce is made from condensed cream of mushroom and chicken soups. 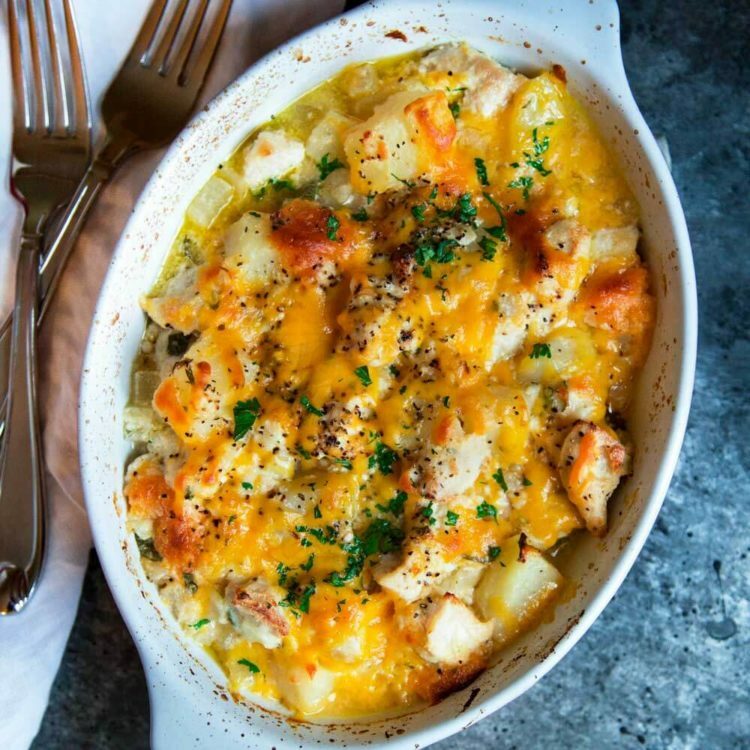 Mixed all together with some flavor weapons like sour cream, garlic powder and sherry, this is baked in a casserole dish topped with lots of mozzarella and parmesan cheese! 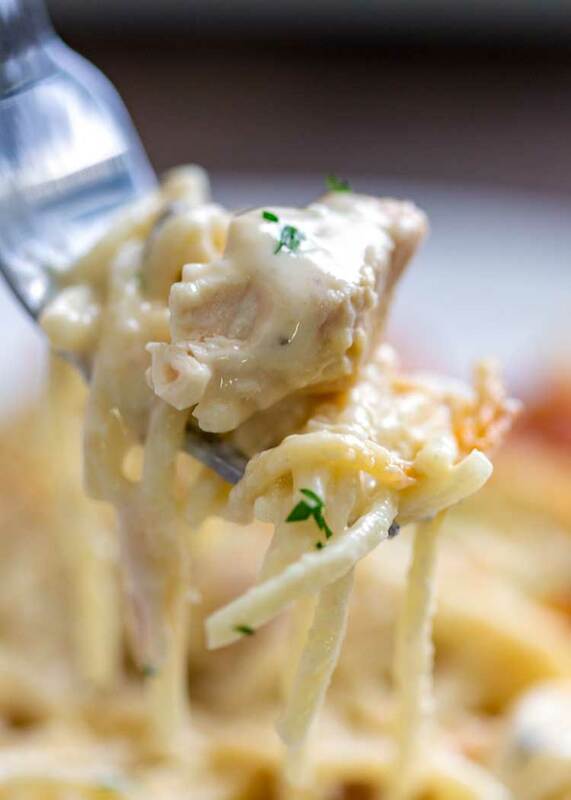 Creamy, cheesy coated chicken chunks swirled in pasta. 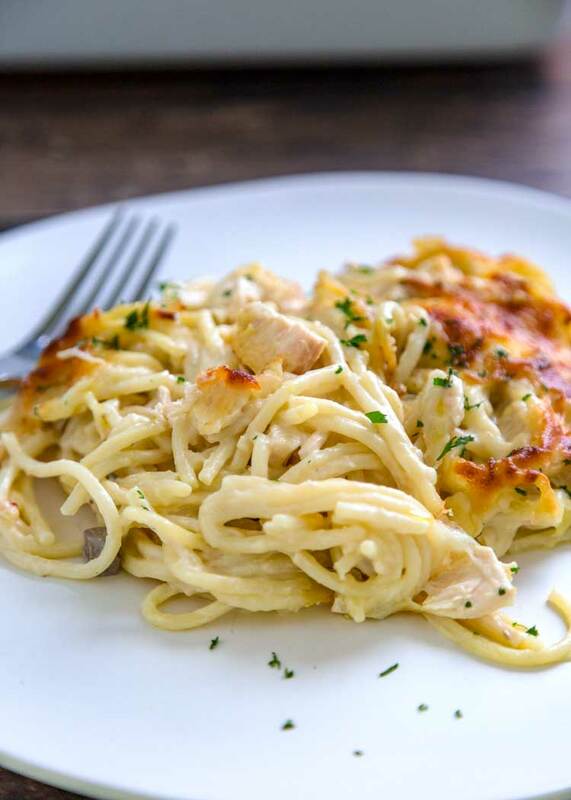 When making this Chicken Tetrazzini, the sauce may look like too much, but trust me, the pasta soaks it up while it bakes. 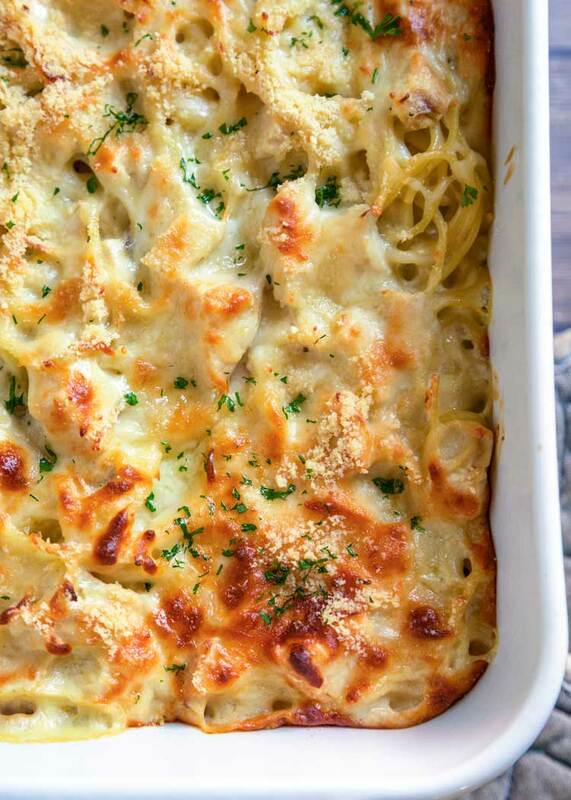 The shredded mozzarella and parmesan cheeses melt to a golden brown on top. Just delish! This works well to freeze too for a later time. For any leftovers, I drizzle on some milk to get it a little moist and heat it up. Enjoy! Preheat the oven to 350°F. Cook pasta in heavily salted water for 10 minutes. Drain, do not rinse, and toss with some olive oil. Set aside. In a large bowl mix together the garlic powder, sherry, sour cream, cream of mushroom and cream of chicken soups and chicken broth until well combined. Gently mix in the chopped chicken and cooked spaghetti, tossing to coat. Pour evenly into a greased 13x9" pan coated in cooking spray or olive oil and sprinkle mozzarella and parmesan cheeses evenly on top. Bake for 30 minutes. I like to use 2 rotisserie chicken breasts. Remove skin and chop breast meat into bite size pieces. Do you freeze before baking? If making ahead of time to have at a later date then yes. Everything basically has been cooked already. Follow recipe instructions if eating right away. This was a hit in my household! Thanks! So glad you enjoyed this one Charity! Thanks for taking the time to come back and let me know. I see you have some green type of herb in your dish that is not called out in your list of ingredients? What is it? It’s actually some minced parsley for garnish Bob. You may use an equal amount of apple cider vinegar, or substitutes like dry red or white wine instead of sherry work fine, too Cheryl. 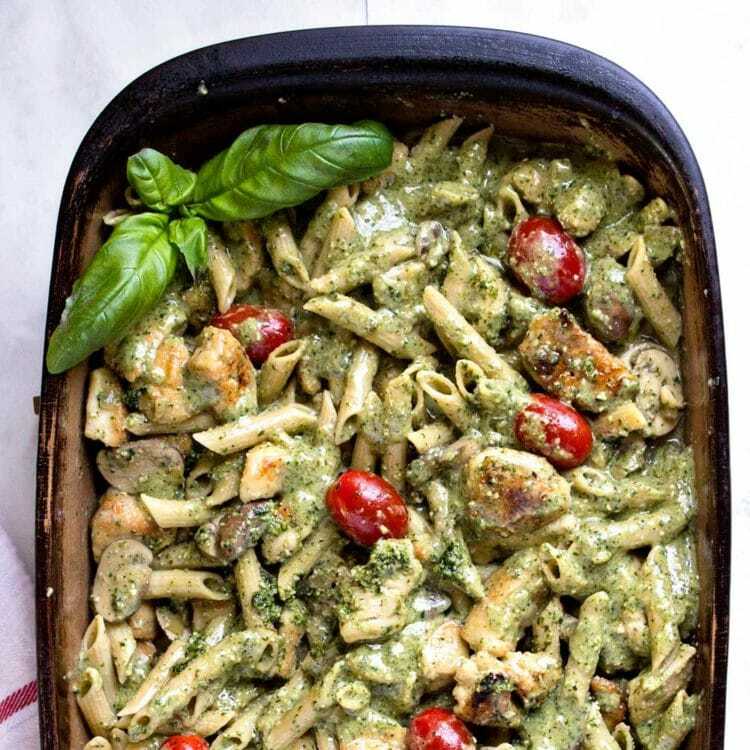 Your photos alone make me want to head to the store right now for the ingredients. I haven’t made chicken tetrazzini in so long Kevin! And wow! I don’t know why! ?This looks amazing. You’re totally inspiring me! Thanks Mary Ann. Hope you guys stay warm and full eating this one! 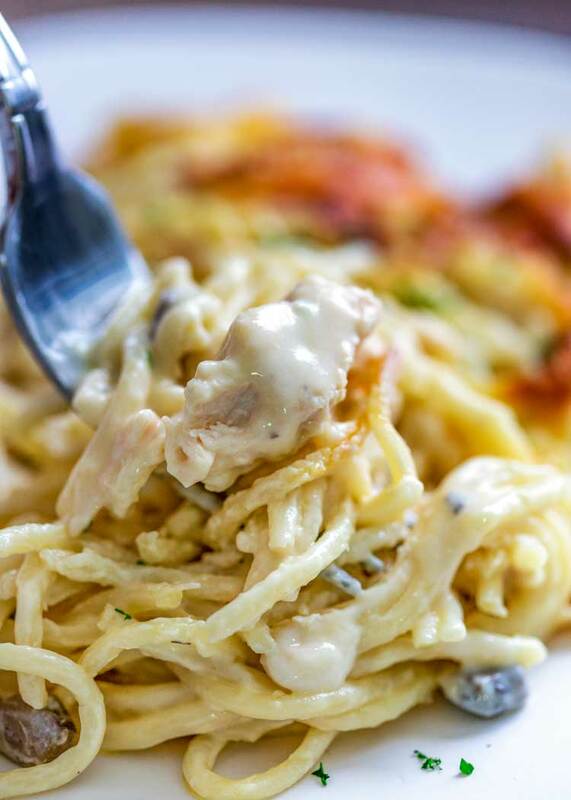 Chicken tetrazzini is one of those classic dishes that I can NEVER get enough of! Especially during the colder months! 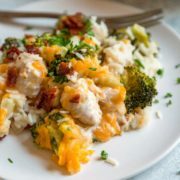 The perfect comforting dish! Pinned! I know, me too. Love this one. Thanks Chey! Kinda felt like I was channeling my inner 1950s housewife when I made this dish tonight, but was it ever good. It got rave reviews all around. My only note is I may have added too much chicken stock as the bottom seemed a bit wet – I’ve put the remainder back in the oven on low to dry it out a bit before I freeze leftovers. Next time I may add some bread crumbs as well. Thanks for the throwback recipe! Thanks for taking the time to come back and let me know. I know, me too! It’s actually raining and cold here as well and this is the perfect kind of comfort food Dawn!